Welcome to Yokohama Shiloh Church. The founder of our church, James Curtis Hepburn, M.D., a medical missionary of The Presbyterian Churches of America, arrived in Yokohama with his wife on October 17 1859 (Ansei 6) to sow the good seed in Japan. At an early period, he was engaged with few interruptions in daily dispensary work, as well as in teaching English language and general academic subjects to Japanese young men. Some of those young men of his school led the enthusiasm to establish a Christian church, and our church was founded on September 13 1874 with Rev. Henry Loomis of The Presbyterian Churches of America as the first pastor. The first location of the church was at Missionary Residence No. 39 in Yokohama, then it moved to the present site, and then to Ohta Cho and Sumiyoshi Cho, and then finally it relocated to the present site in 1892. Through the efforts of Dr. Hepburn, a red brick church building was erected. The church was named "Shiloh Church" after his mother church in Milton, Pennsylvania. "Shiloh" means Messiah, the one that brings peace, in the Old Testament, and it is also the name of a sacred town in old days. 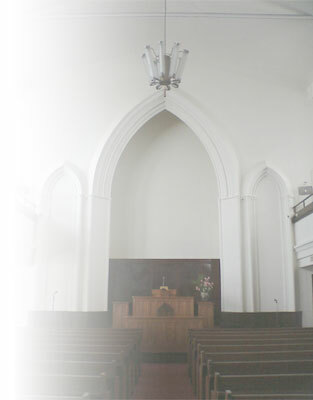 The great Kanto Earthquake in September 1923 destroyed the original church building, and the present building was built soon after the Earthquake. During the World War II air raid of Yokohama on May 29 1945, all the inside of the present church building　was burned down. In spite of hardships after the War, our church has been devoting itself to its mission of promulgating the Gospel, led by the Word of Christ and faith. As one of the commemorative projects of the 125th anniversary of its founding, our church installed a Mathis (Switzerland) pipe organ. Shiloh Church continues to pursue its way, fully respectful of the tradition of the Presbyterian Church, to provide the place of worship where "the Gospel of Christ is told justly and rightly, and is listened sincerely.